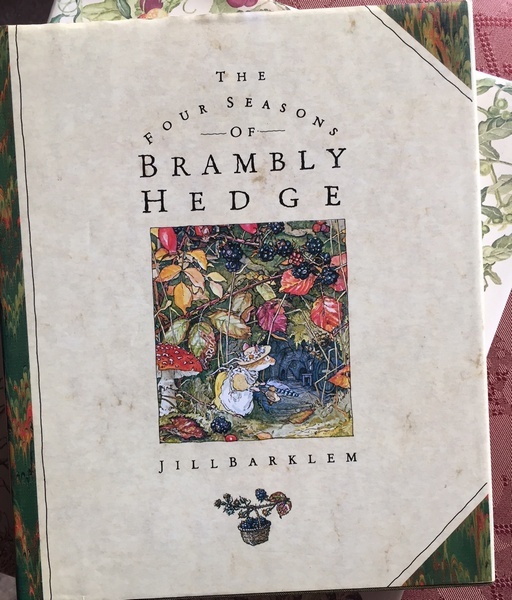 Illustrator Jill Barklem of the Brambly Hedge series died recently. I love her work and when my kids got me this one and other books by her several years ago, I was thrilled. For hours a person can get lost in this magic. If you loved Beatrix Potter, then this book is a step beyond. 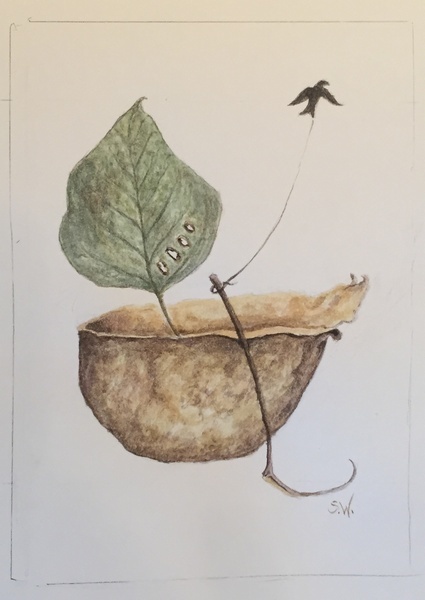 The details of the interiors of these little mice’s homes all neatly tucked into the woods, and their little clothes and shoes and smiles….terrific. Jill Barklem was amazing. She would spend years doing her research before starting on a book. In this one in particular she tells you how she does her drawings. It was her mention of the pen outlines that really intrigued me. How could she be so sure as to where to put those permanent lines? And the lines always a soft walnut ink color. With the calligraphy nibs that a friend sent recently and a small pot of walnut ink waiting in the studio to be boiled down, I thought I would give it a try. 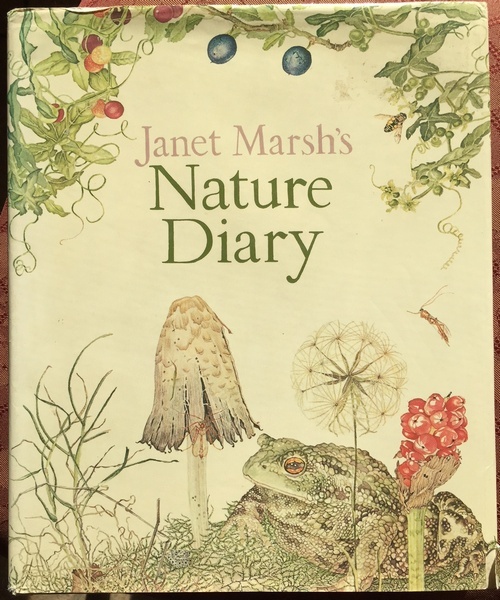 Another favorite book of mine is this one by Janet Marsh. I think I bought it when it first came out in the eighties. Another English illustrator. 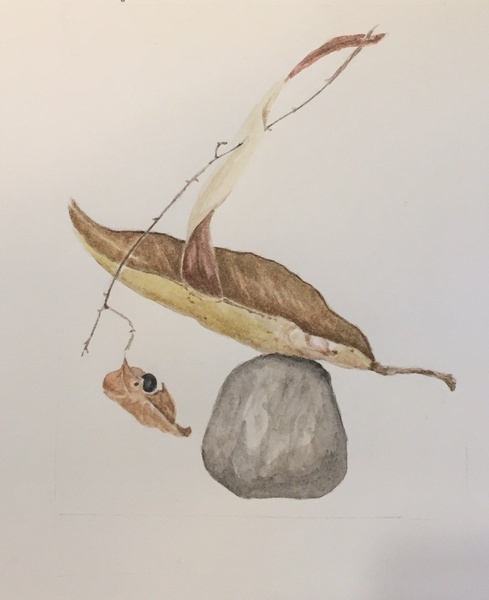 Janet went to a pond to document in the most beautiful watercolors what was happening there. I love this book and her dedication to documentation. See the similarities? Look at those delicate marks and just how beautiful it all is. Anyway, I got inspired (again) and decided to just escape into the fantasy with my own limited abilities. 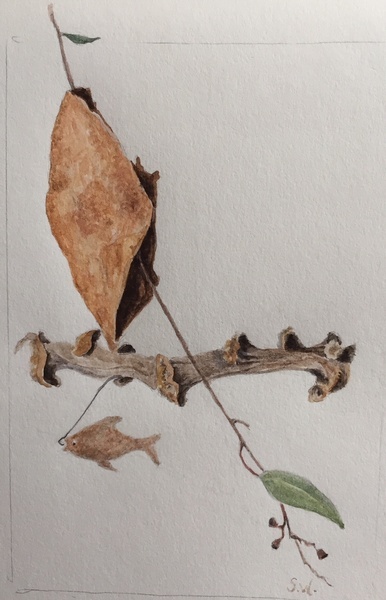 Giving myself limits of size and pieces, I decided to go about making a boat-like thing using only three things from the natural bits in my studio. Then the boat would be obviously afloat or well-grounded with the addition of some other thing. They are each drawn into a marked space of 5 x 7 inches. I loved having the bird in charge of the oar. Fun. So now number 2. 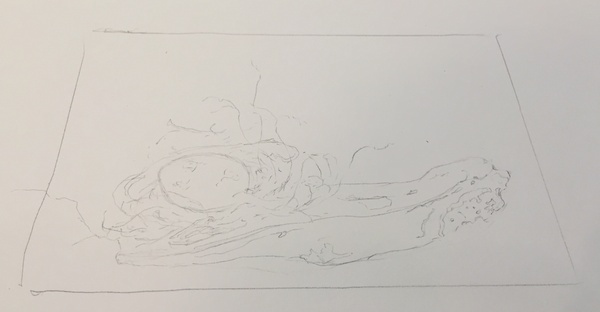 The drawing first. I am using my new pencil. 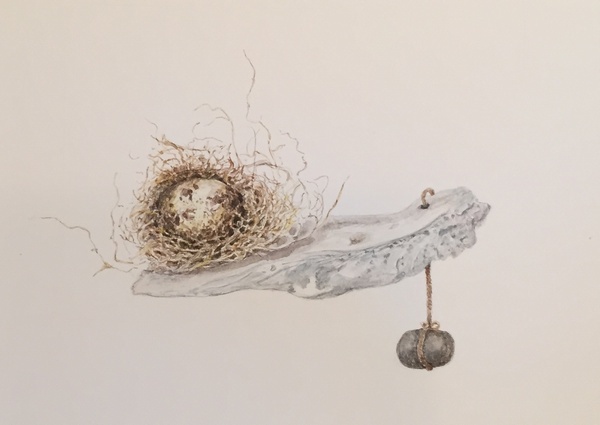 An oyster shell, a nest and a quail egg….rock for an anchor. Likely this boat is not going very far. This one is well and truly stuck on a rock. A fish is helping this one along. There will be some touch up work on them and certainly better photographs if I want them to have another life beyond Inga’s sketch book. But for now, they are quite satisfying. The size is small, as are the expectations. The challenge is simple….just go ahead and do it. Think about Janet and Jill and just do the best you can. Simple.